Given yesterday’s tumultuous election in Turkey, I thought it might be a good idea illustrate using the data available what just happened. There’s the obvious: AKP lost about 10 percentage points of its vote share, and the Kurdish-and-what-not HDP received around 13 percentage points, pushing it above the ten percent threshold, allowing it to take seats in parliament – as far as I know, the first time a political party with such a clear pro-Kurdish constituency has done so. This means AKP’s seats in parliament fell from the 327 it won in 2011 down to 258. Then there’s what it all means, which there’s no way I can discuss in one post. Instead I want to focus specifically here on the HDP and what kind of electorate brought it above the ten percent threshold. Some herald Demirtaş. the HDP, and its electoral success as the comeback of the left or liberalism (here and here), noting amongst others his supportive stance toward the LGBT community as well as his background as a human rights lawyer. It is not for nothing that many refer to him as “Kurdish Obama”. A following question is then to what extent HDP’s electoral success is a manifestation of the voting power of progressives and liberals in Turkey? Despite talk of “borrowed votes”, i.e. 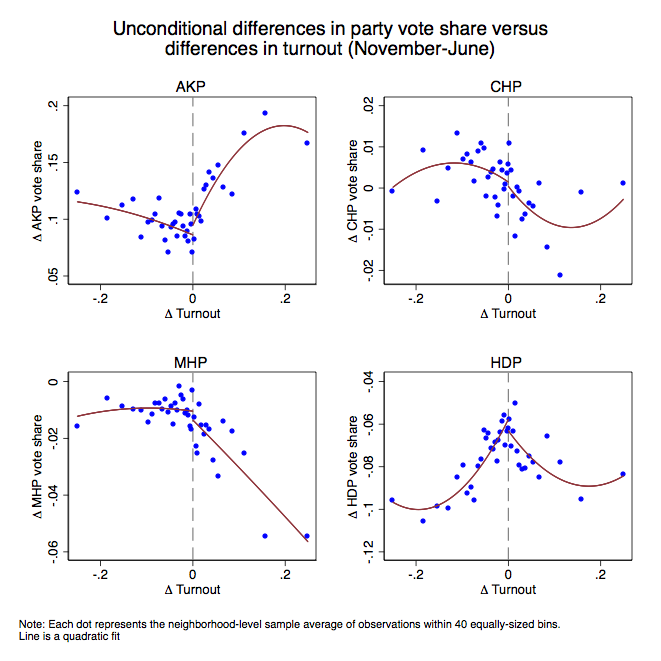 strategic voting by (I assume) predominantly traditional CHP supporters, an initial look at the election suggests that what pushed HDP into parliament was a shift among traditional right-wing voters – the socially conservative Kurdish communities in the East and some living in the large cities who abandoned the AKP for the HDP. This entry was posted in elections, turkey on June 8, 2015 by Erik. 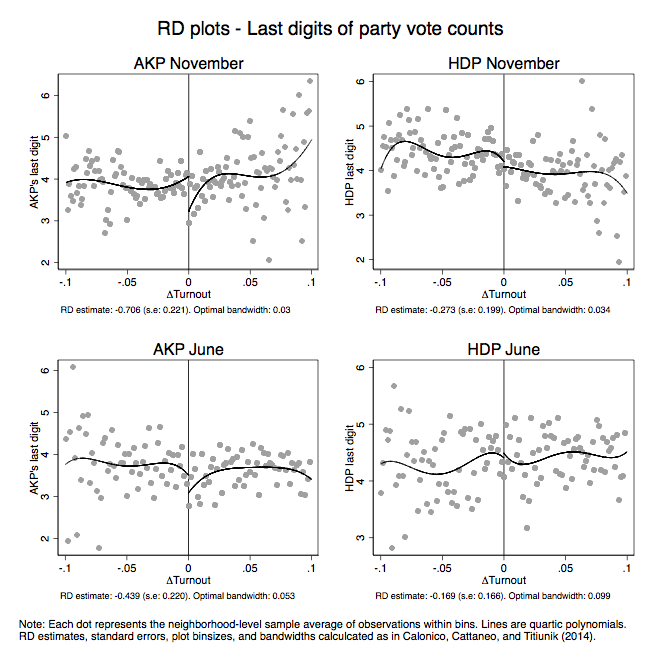 I recently (finally) had the chance to take a look at the Turkish presidential elections data from August 2014, with the aim of comparing some of the measures of election irregularities I documented from the earlier local elections in March of the same year. The analysis from those elections were essentially a snapshot of potential irregularities with little to say about how this evolved over time. “An obvious question mark in the analysis is to what extent any correlation represents systematic mistakes, not systematic fraud. 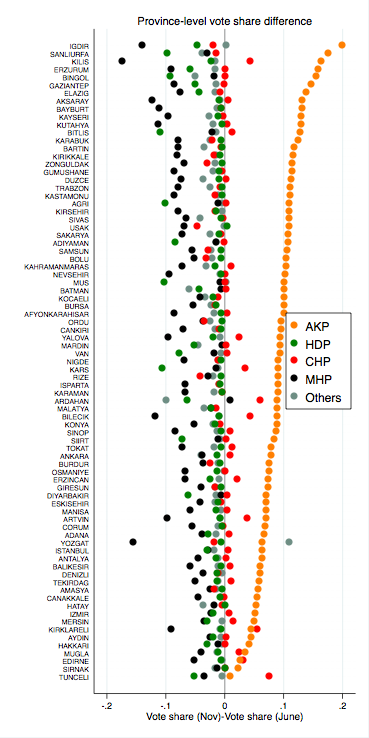 Suppose the AKP has a higher support among the illiterate who are more likely to make mistakes when voting. 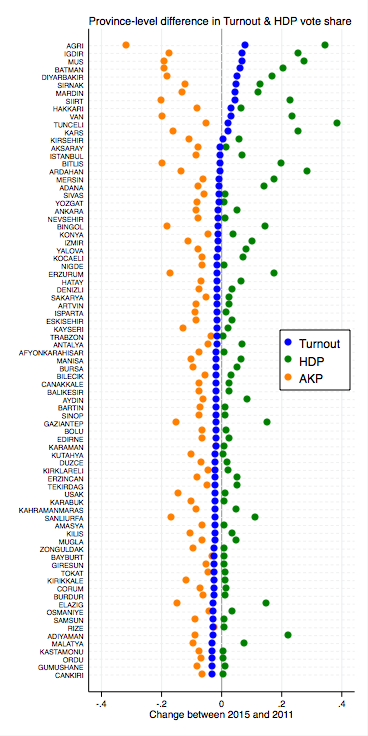 In this case, we would not be surprised if there was a correlation between invalid ballots and AKP support. An explanation would be that those more likely vote for the AKP are also those more likely to make voting mistakes and have their ballots declared invalid. Given the large difference across districts in the large cities in Ankara and Istanbul, one can easily imagine this as a plausible explanation for the simple unconditional correlations. It is here that the fixed effects used in the previous analysis becomes crucial, i.e. including fixed effects (FEs) to regressions of vote shares on invalid ballots control for all factors that vary across the FEs. Adding FEs for districts (Ilce) means we’re only looking at variation across ballot boxes within districts, whereas adding FEs for voting station means only looking at variation across ballot boxes within voting stations. 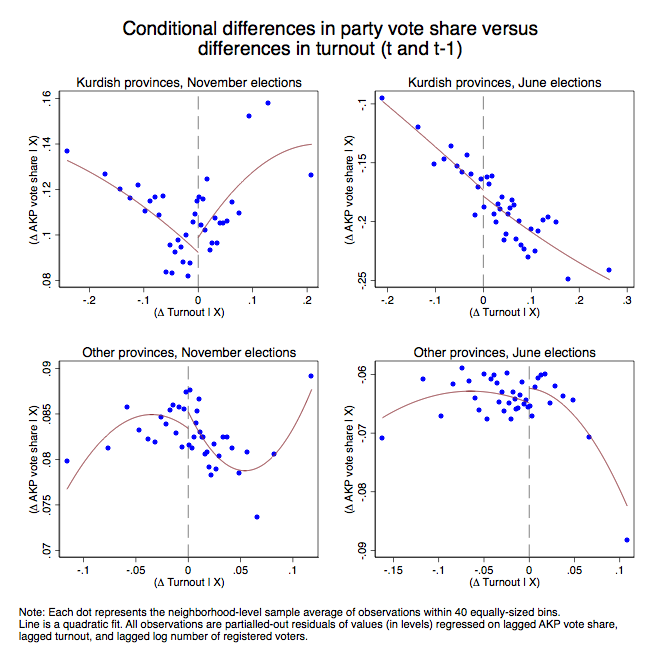 When doing this, although voters going to the same station to vote may still differ along several characteristics, it is much more difficult to argue that this systematically affect their likelihood of making mistakes in voting. The strength of the FEs is thus not that they control for everything, but that they reduce these differences to the point where it is less likely that the remaining differences represent an competing explanation for the correlation. 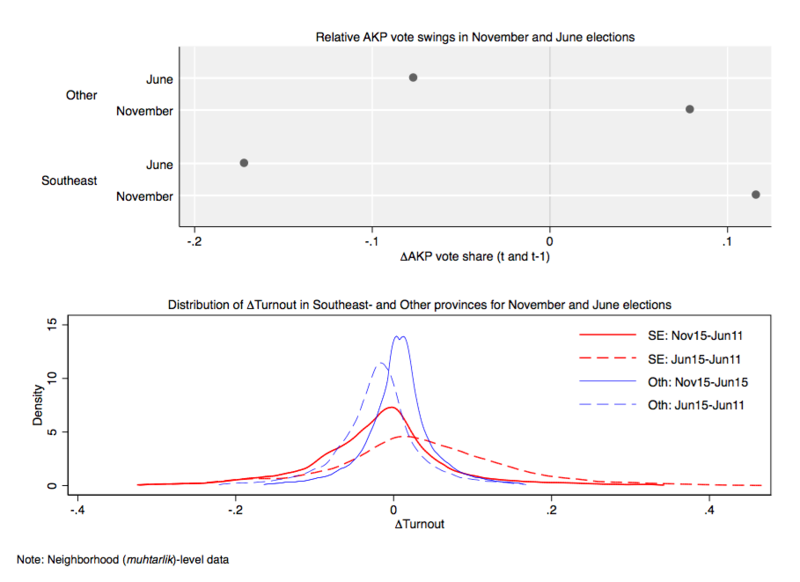 Below I show such correlations between the AKP’s vote share and the invalid share of ballots, with red representing the August presidential elections and blue representing the local elections. These are essentially the same kind of graphs as the first set of ones I posted here, the main difference being that I now from the start subtract the voting station means from the ballot-box level data. Another difference is that instead of plotting the raw voting data (which, with large amounts of data, makes graphs overly crowded and visually less attractive) I’m plotting equal-sized binned means – essentially a scatterplot of grouped data, with groups made up of equally large number of observations (see here for an easy way to implement such grouped scatterplots in Stata). This entry was posted in elections, turkey on June 1, 2015 by Erik.